A postcard view of the so-called "Suicide Curve" at 110th Street. It was agreed by City officials that an elevated line would solve the problems of serious congestion in Manhattan. In fact, the first proposal was as far back as 1825, by H. Sargeant. There were dozens of others over the decades that followed until Charles T. Harvey received his patent June 18, 1867, and actually saw his design built and operational. On April 20, 1866 the West Side and Yonkers Patent Railway Company was formed by Harvey and eventually got awarded the approval to begin construction of his elevated line up Greenwich Street, then Ninth Avenue from Battery Place to 30th Street. Construction began July 1, 1867. The first column was erected October 7, and tested in December. The method of operation was a continuous chain or cable wound around a drum, the cable being attached to a passenger coach on the tracks above. The drum was driven by stationary steam engines placed beneath the sidewalk at certain intervals. This would propel the cars to the next engine and the next, thus moving the car along the tracks. The demonstration proved satisfactory to the delight of the stockholders and company officials. The company constructed three miles of track, although they had a mandate to construct twenty-five miles uptown. The Rapid Transit Commissioners inspected the structure and made a favorable report on July 1, 1868. The plan and operation were approved. Mayor John T. Hoffman, and a deputy inspected the line also. It also passed muster. From 1868 through 1870, the line ran on a single track and was extended to 30th Street. The name changed to the West Side and Yonkers Patent Elevated Railway Company, the last station being at 29th Street. Almost immediately there were mechanical problems, not to mention financial and legal difficulties. This cable system proved impractical and was finally abandoned and remained idle for months. Creditors bought the line at a Sheriff's Auction on November 15, 1870 at a purchase price of only $960 (Nine Hundred and Sixty Dollars). The equipment included three complete passenger cars; four vaults where the machinery was located and patent rights. The new investors substituted the stationary engines for small steam locomotives. There were objections from the Boss Tweed crowd, pushing for his viaduct scheme as well as injunctions introduced by the horse-car companies which, up until this time, had no competition. On February 9, 1871, the Transit Commissioners granted permission for the elevated railway company to proceed with their plan to discard all previous equipment and replace it with steam locomotives. Repairs were made to strengthen the existing structure and steam operation began on April 20, 1871. There were only two stations at this time, one at Dey Street, the other at the end of the line at 29th Street. The company adopted the name the New York Elevated Railroad Company. Thus commenced the world's first successful elevated railway. Steam power was to be used on all subsequent lines until the advent of electrical operation in 1902.
and many eminent engineers and civilians. Footnote to above article: The inventor's name was never mentioned. It was, of course, Charles T. Harvey. It may be noted that Harvey was never given the acclaim and appreciation for his achievement. He is the engineer who presented us with the city's very first elevated railroad, into which he invested much of his life and finances. His engineering skill and vision initiated the expansion of rapid transit of which the elevated railroads dominated for thirty-seven years. As quoted in William Fullerton Reeves', The First Elevated Railroads in Manhattan and the Bronx of the City of New York, (N.Y., 1936) "Nothing in the city's history has done more for its growth and advancement than that system of transit, and Charles T. Harvey was its originator and the man directly responsible for its achievement. There are monuments in New York City, but none to him. He gave us his utmost, in time, money, and brains, but has received no permanent recognition." Harvey died in 1913. This next entry is a rather detailed accounting of the Greenwich Street Road as recorded once again in the New York Times. The descriptions highlight the construction and method of operation. Thirtieth-street by the first day of November next. interferes with the transit of passengers by horse-car routes. The original stockholders of the Company were Messrs. C.T. The final article in this series talks about the "motive power" not being successfully demonstrated. They are already experiencing problems. By 1891, the rebuilding project was extended all the way north to 116th St., creating Manhattan's first three-track elevated, although center-track express service did not begin until 1916. In upper Manhattan, the line had to accommodate the changing landscape; the 9th Ave El was over 100 feet above the street at "Suicide Curve", the portion of the El that made a 90-degree turn from 9th Ave onto 110th St. and another from 110th St. onto 8th Avenue. The 9th Ave. El would extend all the way to 155th Street and terminate adjacent to the southern terminal of the New York and Northern Railroad (later the New York Central's Putnam Division). This junction would allow suburbanites an easy transfer to the 9th Ave El for points in downtown Manhattan. Eventually, the Polo Grounds would be built at that location as well. Behind the Polo Grounds was the 159th Street Yard, the largest elevated yard of the Manhattan Elevated Railroad Company. The 9th Avenue El played host to various tests of electric operation between 1885 and 1900. In 1900, a test of "Sprague"-style MU cars was performed on the 6th Avenue El, prompting electrification of the whole system. Electric trains operated along the 9th Ave. El beginning on February 18, 1903. On April 1, 1903, the entire Manhattan Elevated system was leased to the IRT Company for 999 years. Subway system construction was planned to connect with the Els at various points. By June 25th, 1903, the last steam-powered elevated train was operated in passenger service on the 9th Ave El. On July 1, 1918 the 6th and 9th Avenue Els extended operation to 167th St. station of the IRT Woodlawn line over a bridge built by the New York and Northern Railroad, which terminated operations at 155th Street on January 6th of the same year. 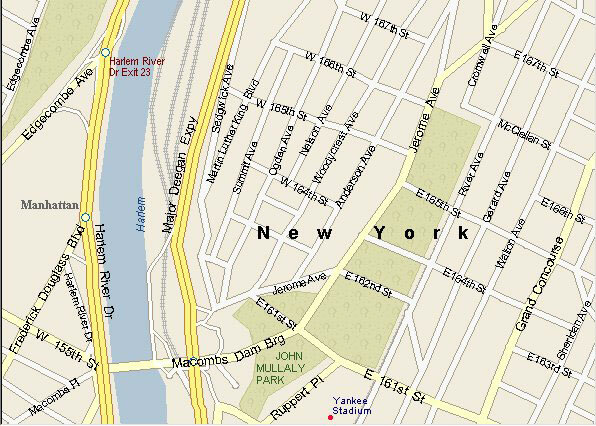 The opening of the extension coincided with the cutback of the Putnam Division back to Sedgwick Avenue on the Bronx side of the Harlem River. The 155th Street terminal had two island platforms serving four tracks (plus one bypass track); the eastern platform served through trains to the Bronx, the western platform served trains terminating at 155th Street. Although the terminal was elevated, there were stairways leading down to the street and up to the 155th Street viaduct, connecting the Macombs Dam Bridge with "Coogan's Bluff". By January 2, 1919, 9th Ave. El service was extended to the Woodlawn station of the IRT. On August 26th, 1932, the IRT went into receivership one month short of its 28th birthday. The 5 cent fare had taken its toll. Unification of the privately owned transit lines with the Independent City-Owned Rapid Transit Railroad (IND System) occurred in June of 1940. Municipal operation of the IRT would begin on June 12th, 1940, two weeks after the City of New York took over the BMT. As part of the Unification deal, the 2nd Ave. El north of 59th Street and the 9th Ave. El in Manhattan would close forever at 12:01am on June 12th, 1940. There were no special ceremonies held for the closing of these lines. The last train on the 9th Ave. El, a 7 car train filled with 500 people, left South Ferry at 11:14pm, arriving at 155th Street at 12:06am. Free transfers at 155th St, Manhattan, and 161st St. in the Bronx, were made available to the Independent's Concourse line when the El closed. The only remaining portion of the 9th Ave El, the "Polo Grounds Shuttle" to Burnside Ave (later 167th Street), closed for about 1½ hours at the close of 9th Ave. El service, to prepare this portion of the line for its new service pattern. The June 12th, 1940 ceremonies marking the takeover of the IRT by the city saw former Mayor James Walker in attendance. The ceremony basically was the surrender of Contracts 1, 2 and 3 to the City. LaGuardia called Contract 3 (the contract specifying the 5-cent fare) "the most famous football in history". He couldn't find "the father of the 5 cent fare"; no-one was willing to admit, or knew, who's idea it was. The "Polo Grounds Shuttle", as it was called, saw little patronage because of the redundant IND Concourse Line running so closely nearby. In addition, the New York Central's Putnam Division stopped running, and in 1957, the Giants played their last season in the Polo Grounds. With so little ridership, the "Polo Grounds Shuttle" ceased operation at 11:59pm on August 31st, 1958. Sources: Electric Railroads #25: New York's El Lines, 1867-1955, December 1956, Electric Railroader's Association. New York Times, June 12th, 1940. Unpublished NYCTA Facts and Figures Document, 1977. The Tracks of New York Number 3: Manhattan and Bronx Elevated Railroads, by Alan Paul Kahn and Jack May, 1977, Electric Railroader's Association. Group photo at the 155th St / 8th Ave entrance to the IND Concourse Line. Photo by Mark Feinman. The 9th Avenue El ran north from Manhattan from 155th Street on a bridge across the Bronx River, connecting to the existing #4-Jerome Ave. IRT elevated line near 162nd St. and Jerome Avenue. The line opened as far north as 155th St. in 1879, and was extended to meet the Jerome Ave. IRT in 1918, which itself had opened a year earlier. In 1940, the line was cut back to a shuttle operating between the Polo Grounds at 155th St. Station and the Jerome Ave. IRT. This shuttle ceased operation in 1958. Sedgwick Avenue The Sedgwick Avenue station is under the Major Deegan Expressway but above the level of the Metro-North tracks. In order to get to the station, we had to climb down the embankment that supports the southbound Major Deegan. Once we climbed down this steep hill, we were able to climb up onto the Sedgwick Ave platform. The portion of the Sedgwick Avenue station that was above today's Metro-North tracks was wooden; none of it remains. The portion that was on the embankment and under the Major Deegan, was built of concrete and much of this structure remains, although there are no signs identifying the station at all. The wooden portions of the structure ended about 50 feet from the small stairway onto the concrete catwalk seen below. Evidence of two subway-type entrances could be seen on the eastern portions of both the uptown and downtown side platforms. A picture below shows that the bricked-up entrance was partially broken into, and a peek inwards revealed the standard yellowish station tiles that can still be seen in many subway stations today. Picture below is the remains of part of the uptown platform, where the staircases leading up to the pedestrian overpass once stood. The outlines of the tunnel portals could easily be seen. There was an opening in the "wall" covering the entrance to the "eastbound" trackway. It was a rectangular opening, basically a double doorway with no door. The Sedgwick / Jerome Ave. Tunnel. After viewing the Sedgwick Ave. station, the group proceeded into the tunnel, walking on the ballast where the eastbound track had been. The westbound tunnel was sealed at this end. Several wrecked automobiles were found in the tunnel right-of-way near the Anderson Ave. station end of the tunnel. They must have been brought there before the walls over the tunnel ends were installed. There were eight signals counted, six of them were still where they were when service ended, the other two were lying on the trackbed. All were in various states of rust-through, with no bulbs and broken lenses. One greeted us as soon as we entered the tunnel. The control box from one of them was found on the tunnel floor. A couple of them still had the signal plates loosely attached, although the enamel had worn off to the point that only tiny patches remained on the bare metal. All rail and ties had been removed, except for one, which was nearly buried by the ballast, which still exists in both tunnels. The westbound tunnel suffers greater water damage than the eastbound tunnel. Worker "escapes" along the outside walls were found at the usual intervals, and access between the tunnels was available every 20 feet or so. What was odd was that there were ladders leading up to the tunnel catwalk (along the center wall) every 10 feet, which seemed "extravagant". Jerome / Anderson Avenue. At Anderson Ave., we were able to climb up on the platform and view what had been the station from the inside. We had viewed this station from outside on the street but could see virtually nothing. There was a definite doorway in the wall that once sealed off the tunnel, again no door in the doorway. We could look out to the street from behind the black fence. Along the downtown side, the fence had a door in it, but that, too, was missing. Had we decided to climb up the rock wall on Jerome Avenue, we would have been pleasantly surprised in seeing that there would be access in this direction, too. The station was littered with garbage and tires from "Rocky's Chop Shop". The area of the platform that serves as the roof of the awning shop was clean, and evidence of recent roof work could be seen. A hatch was drilled into the platform that serves as the awning shop's access for its "roof". We wonder if the shop's owner even knew that 9th Ave El train service once ran on his roof; with all the garbage, it was hard to make out where the trackways were. And like the Sedgwick Avenue side, the sealed tunnels were not entirely encased in concrete; the top 1/4 was grating left open for ventilation. Half of the remains of this station were outside in the "cut" between the apartment buildings, and the other half was underground. The former fare control area for the underground portion of the station is now occupied by a laundromat. Evidence of a failed break-in to this laundromat could be seen at the top of a staircase leading to the fare control area. Jerome Ave. & 162nd St., Street Level. Not much has changed since these pictures were taken (at Jerome Ave. & 162nd St., the site of the Jerome/Anderson "subway" station). The ad for Israel Ruiz is, for the most part, painted over, save for the words "state senator" and part of his image from the glasses on up. To the right of this picture is a rock "wall", which looks like it is climbable on its right side. As a large group, we decided not to climb it, knowing full well that there was "guaranteed" access under the Major Deegan Expressway at Sedgwick Avenue. Had we climbed this rock wall, we would have seen that there was an opening in the fence where a door (a locked door, presumably) was missing, providing easy access to the Sedgwick Ave platform. The station canopy, at one time, extended from the tunnel portal all the way across Jerome Avenue; there was no evidence of the canopy structure anywhere on the platform remains. The folks living in the adjacent apartment buildings have a great view of this area, and probably have no idea that 9th Ave El trains once ran through the mysterious tunnel that's partially blocked. To the left of the pictures below is a distingushing feature of the IRT that is also seen in plain sight along the Queens Blvd. viaduct of the Flushing Line - green tile along the wall. It is partially painted over, but clearly visible. The tilework extended along the concrete structure that once crossed Jerome Avenue. The doors at the bottom of the wall, I presume, were station entrances, and there was no evidence of station entrances on the sidewalk (different concrete on the ground, for example). This area is occupied by a sign and awning business, and a quick peek in yielded no evidence that a station was ever there. If you walk back far enough on 162nd St. between Jerome & River Avenues, you can see part of the Manhattan bound tunnel. (If it were summer, you wouldn't be able to see a thing). You can't tell whether or not it is sealed, even if you looked through a camera's zoom lens. There was no evidence of station entrances on Sedgwick Ave. itself - just a solid rock/brick wall forming the foundation for an apartment house. The Sedgwick Ave. platform is clearly visible from a pedestrian overpass over the Major Deegan Expressway at 162nd St. & Summit Ave. Cross the Major Deegan and you can see the edge of the plaform under the expressway, and remnants of another concrete structure that once held the foundation of a pedestrian overpass across the tracks. On the other side of the overpass is a closed staircase that one time connected to a pedestrian bridge that crossed over what is now Metro-North, for access to the 9th Ave El; it is fenced off. If you continue down the ramp of this overpass, towards the Macombs Dam Bridge, it leads to some brush, and you can easily walk through this brush and step onto these platforms. (Between the time of my walking tour and the actual field trip, either DOT or the Parks Department was through there; all the brush was cleared). Back to the Tunnel. Many of us walked back through the "westbound" trackway - no automobiles blocking the way, but we had to cross back over to the "eastbound" side on the Sedgwick Ave. end through one of the crossover holes spaced at intervals throughout the tunnel in order to get back out. A painted sign indicating the location of Woodycrest Avenue was found in the westbound tunnel. We didn't see any emergency exits in the tunnel at all (but there were "ladders" leading up to the catwalk every 10 feet, something that we felt was unusual). Many of us expressed surprised that there was absolutely no evidence of homeless people in either tunnel. Some of us joked that we were fully expecting to find a body. And unlike some of the currently opened stations along the NYC Subway, there were no track rabbits (rats) anywhere. Jerome Avenue & 163rd St, Street Level.. The girders of the connection at 163rd St. are still there. In fact, the railroad ties remain over 163rd St. At the end of the structure, you can see some more ties and about 20 feet of guardrail, where it ends abruptly by IRT substation 44, built in 1917 and apparently still in use. The space where the el ran to Jerome Ave. along 162nd Street is occupied by a parking lot for a tennis club. The former fare control area on the east side of Jerome Avenue and 162nd Street is now occupied by the entrance to the tennis club. 155th Street, Manhattan. Returning to Sedgwick Ave., the group walked across the Macombs Dam Bridge to the site of the Polo Grounds, and stopped to look at the old El stairways on the155th Street viaduct. We tried looking for remnants of the 159th Street yard; there were none. We tried viewing the Sedgwick Ave station from the Harlem River Drive at the end of 8th Ave; the view was obstructed by the recently built exit ramp from the Major Deegan Expressway for the Bronx Terminal Market and Yankee Stadium. In the Polo Grounds Housing complex, there was a plaque commemorating the Polo Grounds stadium, identifying the approximate location of home plate. At the end of the field trip, the group posed for its group photo. See The 3rd Avenue Elevated for South Ferry Station. "Overview" by G. J. Christiano. "Continuing Story" by Mark S. Feinman. "Walking tour" compiled by David Pirmann from SubTalk Posts. Map by Michael Calcagno.